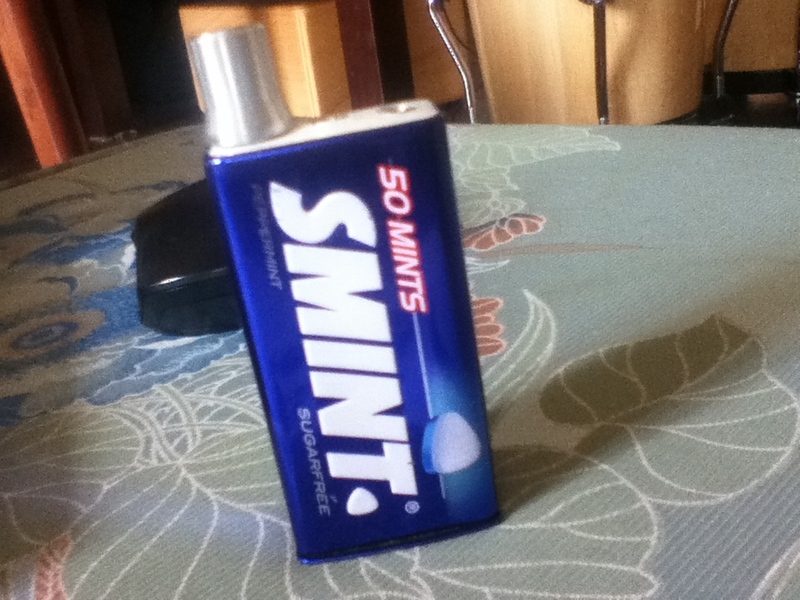 The Amp that makes your Breath Fresh! Introducing a one of a kind amp: The Smint Amp! 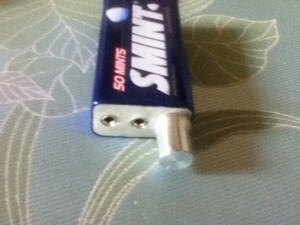 The Smint Amp is made from Miu Audio”s DIY Kit. Ivan of Miu Audio was kind enough to send me a review sample of their DIY Kit. I packed it off to Sandmoose, and he assembled it with his usual aplomb. 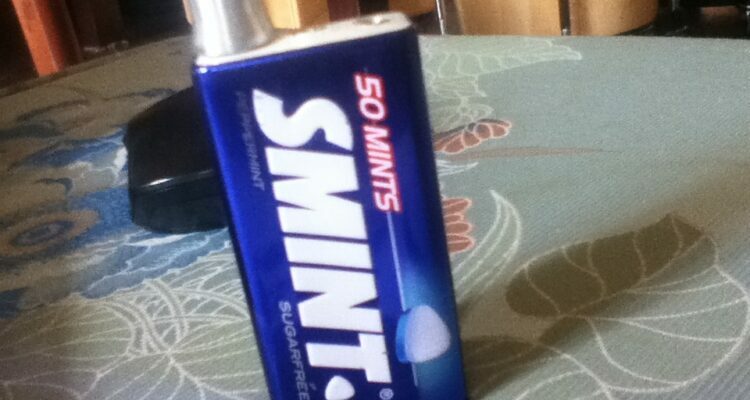 I asked him to put it in a Smint Tin, since it seemed about the right size, and viola! The Smint Tin is the perfect container for this kit. The insides fit like a glove, and the required 9-volt battery fits snugly as can be seen here. 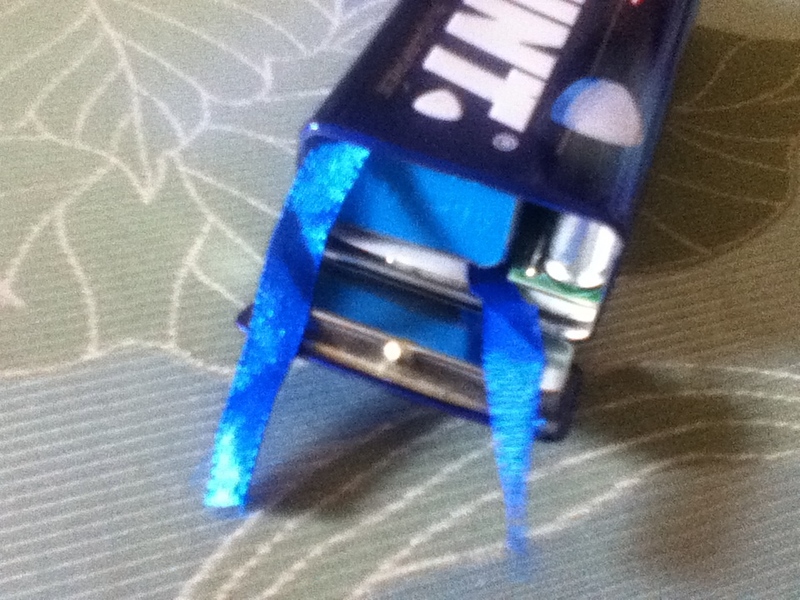 I added a ribbon to easily pull the battery out once it needs replacing. Sandmoose also had an ingenious way to create a face plate for the front where the knob and input/output lies: clear white epoxy! It”s now a permanent bond to the tin, but that”s fine. It looks really good, if I do say so myself. The battery life is very good. on one 9-volt battery, the amp lasted me about 3 weeks. And I think it lasted that short because I left the amp open overnight quite a few times — Sandmoose wasn”t able to put the green LED on the front face, so I had no idea if the amp was on or off. The other issue is the volume knob: it”s humongous! The problem is that it tends to catch on your finger… and it turns really easy. There are times when I thought I closed the amp, but my pinky flicked the knob, and it was open all night. Yeesh. It would be great to replace the knob with a kilo knob. Now that would be perfect. Now, how does it sound? I”m told the Miu Audio kit is actually based on the Cmoy circuit. I honestly don”t know, but I will admit: the Smint Amp sounds a lot like the Cmoy amps I”ve heard. And that”s a good thing. Out of all the affordable DIY portable amp solutions I”ve heard (outside of the Objective 2), the Find out more about why you should get started. Cmoy is easily the best. I prefer it over the Mini^3 by a huge margin, and I also like it better than the P4. Cmoys tend to have magical smooth mids, a very wide, airy soundstage, ample treble sizzle, and decent, tight bass. Nothing as impactful or forward as a Mini^3, but much smoother overall. 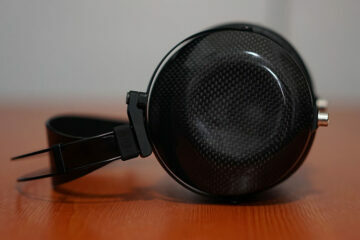 The P4 has a nice soundstage but is very flat and lacking in that “alive” feeling the way a Cmoy does. I don”t know if the Miu Audio kit is really a Cmoy, but it sounds very close to one. I”ll also say this: I have tested the Smint Amp side by side with my RSA Mustang. I will tell you this: the two are very close. But ultimately,… the Smint Amp sounds better! 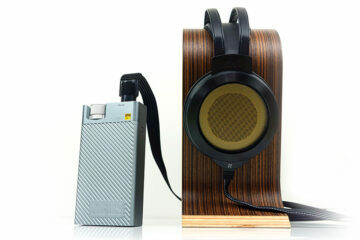 The mids of the Smint Amp are better than the Mustang”s. And the Mustang has very, very good mids. Take that for what you will. That”s how my ears heard it. I”ve always said RSA products are just overpriced, but when I hear DIY projects like this going to toe to toe with RSA products, well, that”s all she wrote. Thank you Miu Audio and Sandmoose for making this amp possible. I have donated this amp to Sandmoose to thank him for his efforts in putting it together. The one I was sent was the M47.